This (see the pictures!) 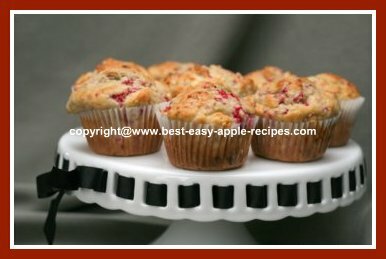 Apple Raspberry Muffins Recipe (or substitute berries), makes delicious fruit muffins that are easy and quick! If you wish, you can substitute other berries, for example blackberries, sliced strawberries, or blueberries in the place of the raspberries. Or, use a few different types of berries in combination with the apples! Be creative! In a large bowl, whisk together the flour, baking powder, baking soda, and the brown sugar until combined. In a small bowl, lightly beat, (with a fork), the milk and eggs. Mix in the melted butter, and then, using a spatula, gently add the fresh berries and the apples, just to combine. Mix the fruit mixture gently into the dried ingredients, just until combined. Do not over mix! The batter will look "lumpy", this is normal. Spoon the muffin batter into a greased, or paper lined muffin tray. Bake at 400° F for 10 - 12 minutes, or until muffins are golden brown, and a toothpick inserted in the center comes out clean. When baking muffins, it is always advisable to bake them on the middle rack in the oven. On the lowest rack, the bottoms burn too quickly, and on the highest shelf the tops of the muffins brown too soon. 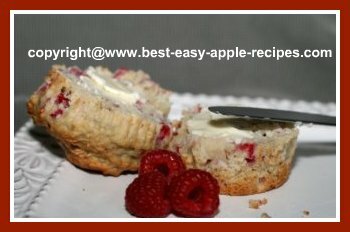 Visit Raspberry Depot.com for a collection of Raspberry Muffins.